Standard CWGC headstone. WW II pattern. 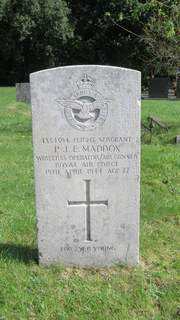 Son of : Herbert W Maddox and Mary Maddox (née Morgan), of Cowes, Isle of Wight. Born : 1921, Forden, Montgomeryshire. The aircraft took off at 22:43 hrs from RAF Witchford to bomb Rouen, and were shot down on their return over their own aerodrome by an Me410 night fighter at 03.48 hrs. All the crew members died and most were buried in their home towns. C Eddy (who was Australian) and Canadian H Bennis were buried in Cambridge City Cemetery.